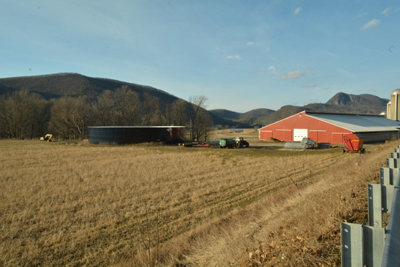 A local Vermont farm waits for spring and new growth. Lent is about spiritual renewal and rather than boast and puff up with pride only to set myself up for yet another burst bubble, let me say my Lenten journey has gotten good...not because I am in charge, but precisely because, I am not. 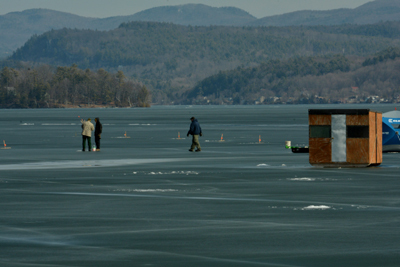 The ice continues on Lake Bomoseen as the die-hard ice fishermen take risks. My commitment to do a simple act of kindness each day turned out to be anything but simple. What I had in mind and what God presented were clearly different tasks. My plan was to take a self-chosen path of doing good and instead God seemed to choose another path for me. It was one that required more patience and humility, and less "accomplishments to feel good about" and more sacrifice in terms of dealing with my own personal annoyances and stumbling blocks, after all, spiritual growth and change of heart is the real goal of Lent. 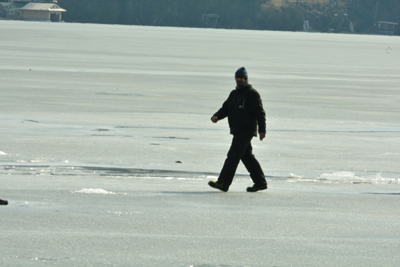 "Walking on water" isn't for sissies, especially as spring approaches! I recently downloaded a book on kindle, A Love Worth Giving: Living in the Overflow of God's Love by Max Lucado, one of my favorite Christian theologians, preachers and writers. He truly has a gift for translating "the holy" into everyday language and actions that I can relate to and his humor in doing so makes self-revelations less painful. It didn't take long to see myself as other's see me, and falling way short of the mark when it comes to loving others as God loves me. Ice is beginning to melt! 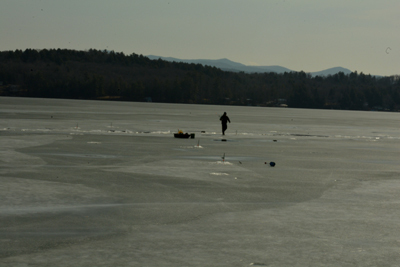 We hope late season fishermen are swimmers too! At the heart, my acts of patience and kindness came with many inward grumbles and silent whines and groans. I found myself a lot like the infamous Grinch, with a heart shrunken from too much focus on myself and not enough on others. I continued my Lenten commitment despite my failings of heart, hoping that if I "faked it" long enough enough, I might "make it". It was not surprising that such an act of conversion first involves self awareness and seeing how I miss the mark! This is likely nothing new to God, but only to myself. How much I live in Neverland where my dreams and expectations exceed my abilities to make them happen. I live ahead of myself and carelessly skip the needed discipline in most everything I do! It is no wonder that I literally turn my ankles frequently, as my head is in the clouds as I am quite literally trying to fly instead of walk!! 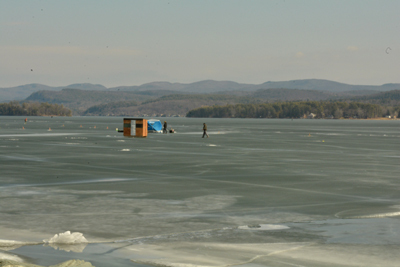 Not many ice shacks left on the lake, a sign of spring coming. My husband, who knows me too well laughed as I told him of my Lenten commitments and he wisely suggested that I instead attempt to do one real act of kindness during this whole Lenten season versus each day? He is more realistic to be sure! 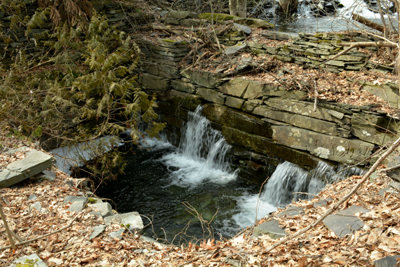 Author, Max Lucado suggests that his readers consider the familiar scripture passage from 1 Corinthians 13:4-7, where love is defined and suggested we substitute our name in place of the word "love"...Paraphrased for me, it would read: "Jane is patient, kind, non-envious, boastful or proud." I didn't need to go on. It made me burst out laughing, as it was clear that I did anything but pass the test. 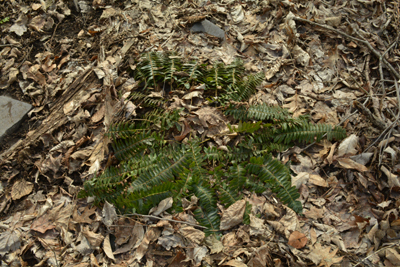 A touch of green as new spring life peeks through. Still I continued, "Jane is not rude, self-seeking or easily angered"....I had to take another pause. I had run out of fingers and toes to cross (a secret I learned to do whenever I told a falsehood when I was a child, less I offend God, a way of letting him know)...but I continued on..."and Jane keeps no records of wrongs"...I saw once again why I must burn my journals before I die, as they are records of all the wrongs of others, never minding my own!!.... "Jane doesn't delight in evil", even though in my dreams I am taking pleasure in testifying against those that have hurt me, as they are drug off to jail, neglecting the fact that I am forgiven for my own transgressions! " Jane rejoices in the truth?" Now I wondered about the truth as I know it, as clearly I work to avoid to see my jealous and envious spirit!... "Jane always protects, trusts, hopes and perseveres", to which I must add "all for the purpose of mostly serving myself". A saint, I am NOT! 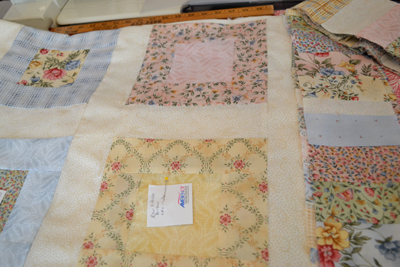 I am so blessed, a quilter with lovely materials, no matter how undeserving. Without God's grace it is clear that I have no hope for the rewards of heaven, let alone the rewards of earth...AND YET, do I NOT have a loving and forgiving family that is there for me always, and haven't my needs all been met? 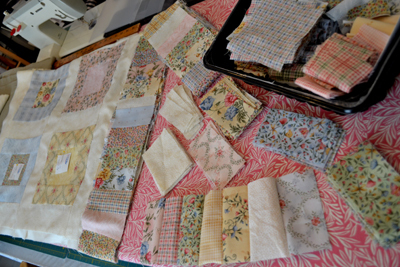 Am I not a sewer and quilter with bins and bins of materials, more than what I know what to do with?...And patterns and threads to go with them? I feel comfort in knowing that I am not the only sinner, and therein lies God's mercy, the quest of my Lenten journey to rediscover what I already know! Disciplined? I have a long way to go! A saint I am NOT! I have also been shown that what was annoying me most about those that God seemed to send to me that stood in my way of doing the more "lovely acts of kindnesses" during these Lenten days have been people that are most like myself, too talkative, too needy, and whiny and filled with concerns. It was as though God held a mirror up to me, and there I am and as hard as it is for me to be patient and kind, I couldn't help but notice how tolerant are those very same people with me? How much I owe versus deserve! My prideful "bubble bursts" don't come easy for me and yet how essential they are for trimming my sails and helping to "ground me" regarding my human condition. How easy it is to forget that I stand on no higher ground than anyone else! Everything in life is a gift and how easy it is to forget that. Appreciating that fact is really the center of the Easter message, and if you aren't a Christian, it is also the center of any newness of spirit or life that seems to comes with spring. 'Tis a gift to come down where we ought to be. 'Till by turning and turning, we come 'round right. I hope you are all rejoicing that Spring is around the corner, and with it, the Easter season of new life! Labels: Lent; Spiritual Renewal; New Life.